The global personal care ingredients market is increasingly fragmented and competitive, notes Transparency Market Research (TMR). Multinational companies largely hold prominent stakes in the value chain, mainly on account of their contracts and strategic ties spanning years. They also wield higher stakes in the global personal care ingredients market due to their financial might, giving them a competitive gain in development activities. TMR finds that in 2014 the leading share was held jointly by three companies, namely, Akzo Nobel N.V., Evonik Industries AG, and BASF SE., as they accounted for nearly 24.4% share in the global personal care ingredients market. The level of competition in the personal care ingredients market is expected to stay unchanged in the coming few years also, as the threat of entry is substantial. The global personal care ingredients market will also see several regional players making foray in the coming years. 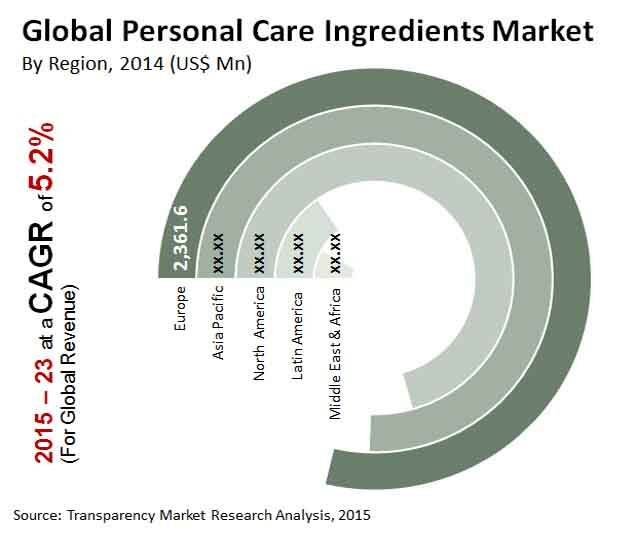 The global personal care ingredients market will clock a CAGR of 5.2% during 2015 - 2023. The market which stood at US$8.19 bn in 2016 will reach a worth of US$11.76 bn by 2023 end. Among the types of application, the use of personal care ingredients in skin care is projected to reach a share of 33.1% by 2023 end. The revenues especially are driven by the demand for products such as hand lotions, baby care products, creams, and body lotions, especially among developing and developed countries. Regionally, Asia Pacific is fast occupying the status of the most attractive market for personal care ingredients. The growth is driven by widespread and copious demand for various personal care ingredients among its burgeoning population. Growing awareness about the benefits of personal care ingredients, especially skin care, in worldwide population is a key factor behind the evolution of the market. Over the past several years, manufacturers were hard-pressed to meet the need of pairing cost with quality, keeping the consumer affordability a central concern. However, rapidly rising demand in emerging markets, such as in Asia Pacific, in recent years has imparted a considerable momentum to the personal care ingredients market. In numerous emerging economies, premium personal care products have also gained some traction. The rising uptake of personal care ingredients in the cosmetics manufacturing industries hinges on the growing demand for functional beauty products. Continually rising investment on research and development (R&D) activities by manufacturers of personal care ingredients has led to a wide assortment of personal care products to meet the current and wide diversity of consumer needs, world over. This adds to the lucrativeness of the personal care ingredients market. Stringent regulations pertaining to manufacturing, approval, and marketing of personal care products have slowed down the overall growth of the personal care ingredients market. In several countries, such regulations are a result of increasing safety norms, especially in established markets of Europe and North America. The fallout is dampened prospects of the personal care ingredients market. For instance, in India, an emerging market, cosmetic companies need to submit safety data for approval for use of personal care products. Nevertheless, growing shift of manufacturers and industry suppliers toward naturally-sourced ingredients is a pivotal trend bolstering positive developments in the personal care ingredients market. With consumers becoming more aware about the health effects of ingredients they use, all-natural solutions for hair care, oral care, and cosmetics have increasingly gathered traction in recent times. The personal care ingredients market is also witnessing lucrative avenue in the rising research into botanicals, which may pave way for more efficacious personal care ingredients.